A constructor is used to create an instance of a class. A constructor that take no argument is called a no-arg constructor. A constructor is used to create an object. In the Java programming language, constructor are declared with the same name as their class used to create an instance of an object. Constructor are invoked using the new keyword. The package keyword is used in Java to group classes together. 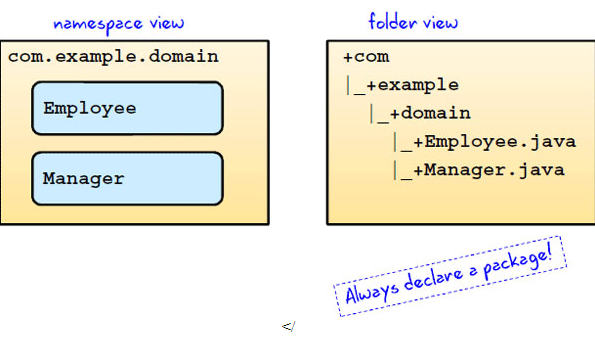 A package is implemented as a folder and, like a folder, provides a namespace to a class. In Java , a package is a group of (class) types. There can be only one package declaration for a file. Packages are more than just a convenience. Packages create a namespace, a logical collection of things, like a directory hierarchy. It is a good practice to always use a package declaration. The package declaration is always at the top of the file. But that would quickly leads to a lots of typing!Insteads, Java provides the import statement to allow you to declare that you want to reference a class in another package. java.sql.Date and java.util.Date. The first is the Date class used to store a Date type in a database, and java.util.Date is a general purpose Date class. As it turns out, java.sql.Date is a subclass of java.util.Date. The import keyword is used to identify classes you want to reference in your class. The import statement provides a convenient way to identify classes that you want to reference in your class. You can import a single class or an entire package. It is good practice to use the full package and class name rather than the wildcard *to avoid class name conflicts. Import statements follow the package declaration and precedes the class. An import statement is not required. By default, your class always imports java.lang*.